OMEGA’s state-of-the-art wind tunnel is designed to give a highly uniform flow rate over a 152 mm (6") test section. A powerful 12 amp motor with variable speed from 0 to 10,000 RPM is adjustable to give a particular flowrate by a precise motor control unit. Each wind tunnel is supplied with an NIST traceable certificate. The uniform flowrate is determined by monitoring a highly repeatable differential pressure sensor which has been calibrated to each individual wind tunnel as a system. Each wind tunnel is supplied with two restrictive plates for achieving optimum low flowrates. The established differential pressure measurements versus flowrates are listed from 25 to 9000 FPM. Calibration sheets are included, which makes calibrating different flow sensors simple. The differential pressure measurement used to establish known flowrates will be affected by barometric pressure and temperature conditions during testing. Depending on the probe being calibrated, humidity may also be a factor. OMEGA’s enhanced wind tunnel package is an environmental monitoring system that measures barometric pressure, room temperature, humidity and differential pressure. By monitoring room conditions, standard differential pressures can be converted to actual differential pressure readings to ensure accurate flowrates. For testing different probes, a 1/2 NPT connection is available. An assortment of compression fittings is provided to help mount the probe under calibration. High Performance Package: Same differential system as standard model, plus HX97-A temperature and humidity sensor, PX02C1-16A5T barometric sensor, PSS-D15B power supply, three DP25-E panel meters, and one DP41B-S panel meter. All equipment is enclosed in a heavy duty, air cooled, benchtop metal case. All 4 meters have 0 to 10 Vdc analog outputs. Wind tunnels come complete with 1/8, 3/16, 1/4 and 3/8" brass compression fittings with PTFE ferrules, two 1.52 m (5') lengths of silicone tubing, operator's manual with NIST calibration data and pressure sensor with benchtop meter. 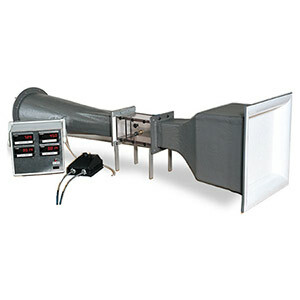 The intake air flow passage to this precise wind tunnel is a fiberglassconstructed baffle. The honeycomb baffle design ensures constant and evenly distributed air intake. The design minimizes turbulent air flow created by movement in front of the intake. The rear portion of the intake baffle has a profile design that keeps the stream uniform, while decreasing the area to a 101.6 x 101.6 mm (4 x 4") cross- section. The test chamber is 101.6 x 101.6 x 152 mm (4 x 4 x 6") and is constructed of clear, thick-wall plastic for easy viewing. In back of this test section, the motor pulls the air through the wind tunnel. The motor and intake profiles utilize fiberglass construction, which minimizes airflow distortion. A monitoring package keeps track of ambient conditions as well as the precise differential pressure measurement. The monitoring sensors and instruments are all packaged inside a single powerful housing. Each sensor has an analog output for use with a strip chart recorder or computer data logging system. Humidity, temperature and barometric sensors are enclosed in the benchtop case for monitoring atmospheric conditions which can influence the exact air speed. The differential pressure cell is connected to the wind tunnel via silicone. Speed Adj. : 10 turn pot. 참고: The wind tunnel comes complete with everything you need to calibrate probes quickly. All accessories, NIST documents, manuals, fitting, etc. are supplied for most any application.